In the beginning thunder was the voice of God. Faeries painted colours on flowers and everything that happened was directed by God. Karl Schroeder was one of the first speakers in the Subtle Technologies symposium. It was called Rewilding Humanity. 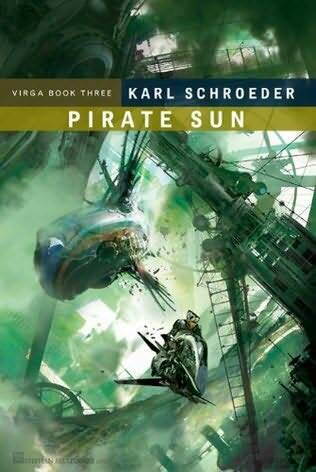 Karl, a sci fi writer, whose recent titles include: Cities of the Air and Pirate Sun delves into the philosophical realm by showing how Western science has re-discovered the divine. I yearned to hear him in conversation with Deborah McGregor. There were many resonances and points of departure as they took us on a journey looking at the same landscape through Anishinabe and scientific lenses. This is what makes Subtle so rich. He first examined The Copernican Revolution, the shift in consciousness that occurred when science discovered that the sun was the centre of our solar system, not the earth. According to Schroeder, that knowledge stripped away the faeries. But recent groundbreaking research in cognitive science describes how the human mind extends into the physical world giving credence to the idea that there is no separation between the perceiver and the perceived. For instance, Karl talks about math as an embodied process. We actually use our bodies to think and we can only do calculations in relation to the world around us. The faeries are back as philosophy shifts into science and scientists realize that we cannot be separated from the world.